Pre-launch videogames, generally speaking, are not the best fit for venture capital. Games are notoriously a hits-driven business, and the sheer number of free titles being released every month makes picking the winners an inexact science, at best. Nothing speaks louder than numbers, though, as Silicon Valley outsider Plain Vanilla Games recently learned, with an assist from the “Twilight” movie franchise. Plain Vanilla was founded in 2010 in Iceland and almost went bankrupt in 2011. Once its first app The Moogies fell out of the Apple App Store’s featured section, sales plummeted, according to CEO Thor Fridriksson. Fridriksson and his two co-founders moved to San Francisco for three months on a tourist visa — without any preparation — and “naively expected people to throw money at us,” he said. After a series of rejections, the company secured $1.2 million in angel investment from Tencent, Sequoia Capital’s “scout fund,” Unity Technologies founder David Helgason and Riot Games co-founder Brandon Beck. But the turning point for the studio, as Fridriksson characterized it, was going to Los Angeles — again, without knowing anyone there — and partnering with Lions Gate Entertainment to develop a trivia game based on Twilight (“Which is this vampire teenager thing,” he pre-emptively explained to me). The numbers and feedback from Twilight QuizUp were “off the charts,” Fridriksson said, and strong enough to raise a $2.5 million Series A, mostly from Greycroft Partners and Tencent. 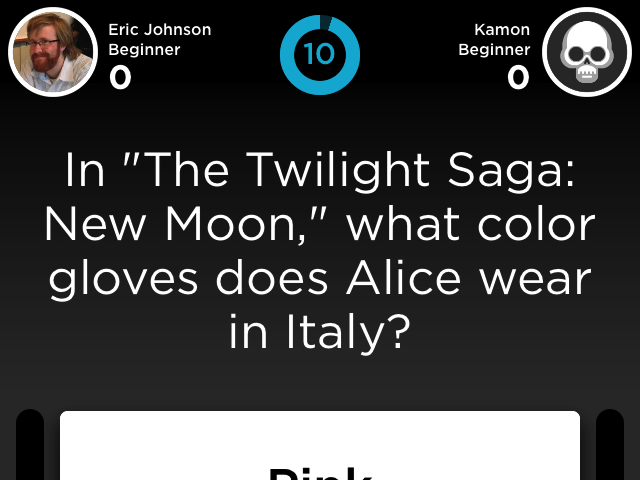 Targeting a passionate niche helped Plain Vanilla make the case to investors that a social trivia game could work. After testing a few more niche QuizUp games (some of which have now been removed from the U.S. App Store), the studio rolled out its big bet yesterday: An all-encompassing trivia game, simply called QuizUp. Fridriksson said the company wants the new app to be for trivia what Words With Friends or Draw Something were for Scrabble and Pictionary. 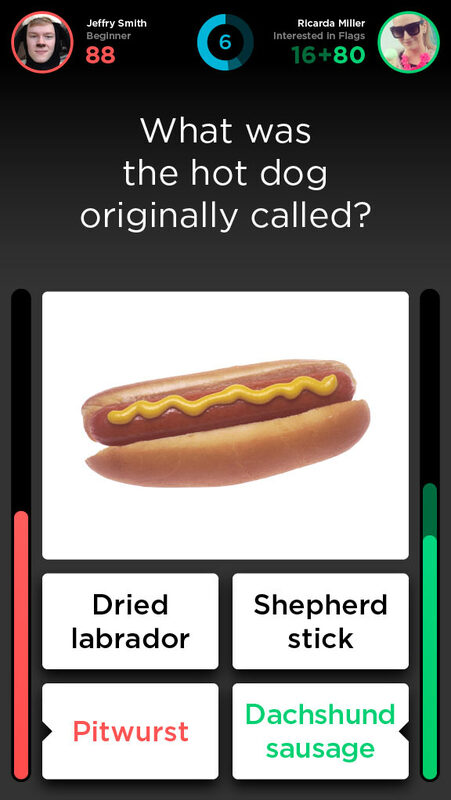 Part of his pitch is that no other trivia app has seen comparable success, but it’s easy to see why: While most of the fun and uniqueness that comes from a word or drawing game is player-created, trivia games ranging from Trivial Pursuit to Jeopardy rely on teams of writers to keep their factoids consistent and of high quality. At launch, QuizUp claims to have more than 150,000 questions from 300 categories, which have been crowdsourced from online fan communities and moderated by a team of 20 at Plain Vanilla. They range from the old-school (“Odin was the most powerful god in which mythology?”) to the incredibly specific (“What is unique about the pit crews in the game ‘NASCAR Thunder 2003’?”). * The game pits strangers or friends against one another in short rounds of questions, awarding experience points and achievements based on the results. “What’s really bothering me about this economy of freemium games [is] when you download them you get really skeptical that developers are trying to trick you into making an in-app purchase,” he said. It’s a valid point, but how QuizUp will get value out of its players remains an open question, unless of course the end goal is an acquisition. The game has already nabbed a spot in the top 50 free apps on iOS (and an Android version is launching “soon”), but after gaining the interest of VCs, the bigger challenge ahead for QuizUp is sustaining that interest among players.